Who knows your students better than you? Often times, it is their parents! Too often, we forget to ask parents about their children. 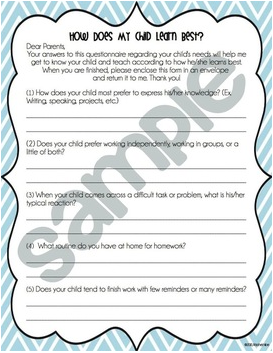 Be a teacher who goes the extra mile and cares to ask parents! 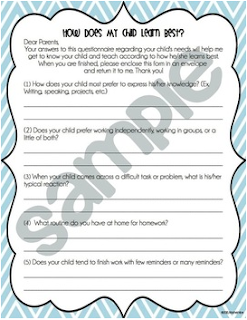 Use this survey to ask about their child's learning preferences, patterns, and habits. Use the information to compare what you see in the classroom to find discrepancies, or deepen your understanding of a particular student. This survey comes in color AND blackline to accommodate all printing needs. The survey is 2 pages and can be easily printed front to back.